Cover crops are turning into a popular topic in Illinois. Not only among farmers but also with gardeners. For the past four years, I have incorporated cover crops into my vegetable garden rotation. Cover crops, also called green manures, are a great soil management tool for vegetable gardens and even home landscapes. Typically, cover crops do not have a harvestable portion but contribute to the garden in other ways. Organic matter in the form of compost is the most common way a gardener helps to feed the soil and all those organisms living within. In most situations, compost can come with a higher price tag, so many are turning to cover crops to add organic matter and save a bit of money. 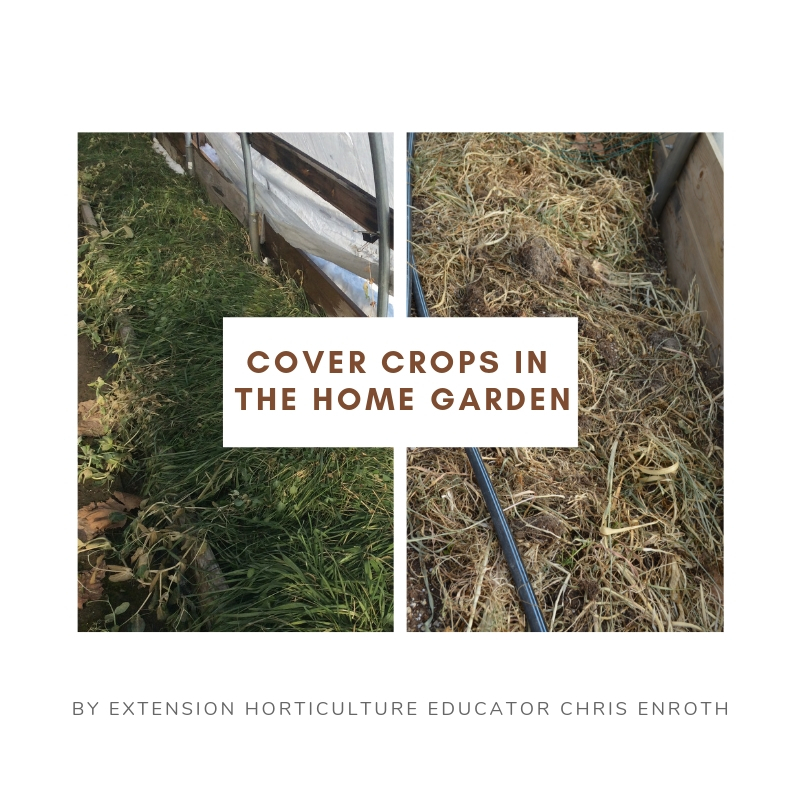 Cover crops can also act as a mulch to suppress weeds. Cereal rye is a popular cover crop that is sowed in the early fall and will put on significant growth the following spring. As the plant begins to form flowers it is flattened and crimped. Crimping is the act of breaking or pinching the tissue of the plant so that it can no longer function. There are lots of special tools that a home gardener can purchase to crimp a cover crop, but a simple piece of angle iron attached to a board will do the same job. Cover crops can preserve soil and reduce erosion. Gardener's work so hard to build up our soils, let's not lose those gains by leaving soil bare and fallow during the off-season. I sow my cover crop in the late summer to early fall months right under the currently growing summer crops. By the time I'm ready to pull my tomatoes in the fall, there is a thick bed of oats and peas to protect the soil over the winter. Another advantage of cover crops is they can be reservoirs for gathering important nutrients like nitrogen as well as micronutrients for the following year's vegetables. Nitrogen-fixing legumes like winter peas or sweet clover can take atmospheric nitrogen and store it in the soil. Cover crops also can offer crucial habitat for insects and a food source for pollinators. Cover crops like buckwheat and clovers can be sources of pollen and nectar for beneficial insects. Note that buckwheat can reseed. Avoid the spread of buckwheat in your garden by terminating the crop with an herbicide, plow under, or plant in the early fall and let freezing temperatures do the job for you. My favorite use of cover crops is one I've seen recently. The City of Macomb was planting oaks along a street in town. In order to remedy the compaction that is all too common in urban soils, the city used a cover crop of tillage radish. Tillage radish grows to near comical proportions, producing a huge taproot that can be up to two-foot deep and six inches wide. This helped to break up the horribly compacted urban soils and created a more habitable soil volume for the trees. There are many different types of cover crops that can be planted at different times of the year. Spring and summer cover crops often need to be sprayed or plowed so they don't set seed. But sometimes cover crops like sweet clover can remain throughout the growing season to the benefit of pollinators. I prefer cover crops that are planted late in the growing season and will then winter kill. That way I don't have to worry about applying an herbicide or firing up the old tiller. The winter-killed plants lay down and create a mulch that prevents weeds in the spring. My fall cover crop mix usually includes peas, oats, and annual ryegrass.